In 2006, our nonprofit organization's co-founders created the Texas Veggin'-out Days campaign. It was launched as a way to support our vegan & vegetarian establishments in Texas and to bring recognition to World Vegetarian Day (October 1) and World Farm Animals Day (October 2). Our campaign was recognized by the North American Vegetarian Society (NAVS) in 2007, when we were awarded "Most Notable Outreach by a Group". Co-founders Kristen Lee Ohanyan & Tosh Schurz were featured in the NAVS magazine for their innovative thinking. Since the beginning, it has been supported by Vegan Meetups throughout Texas, various animal rights groups in the state and the member groups of the Lone Star Vegetarian Network (LSVN). In 2011, our campaign expanded to a week-long celebration and education campaign promoting vegan living called "TEXAS GO VEGAN WEEK". This was the first ever week-long vegan celebration in the state of Texas! Our campaign also kicks-off the start of Vegetarian Awareness Month outreach. Please join us in supporting all vegan food establishments and vendors in Texas during our annual campaign! You can also support this campaign by hosting an event in your city between October 1 and 7. You'll find ideas for events on our Participate link. You can visit our friends at HappyCow.net for listings of vegan restaurants in Texas. Help promote this vegan campaign throughout the state! Are you hosting an event in your city for TEXAS GO VEGAN WEEK? Be sure to also visit the Vegan Society of P.E.A.C.E. Community Events Calendar for events taking place all week! 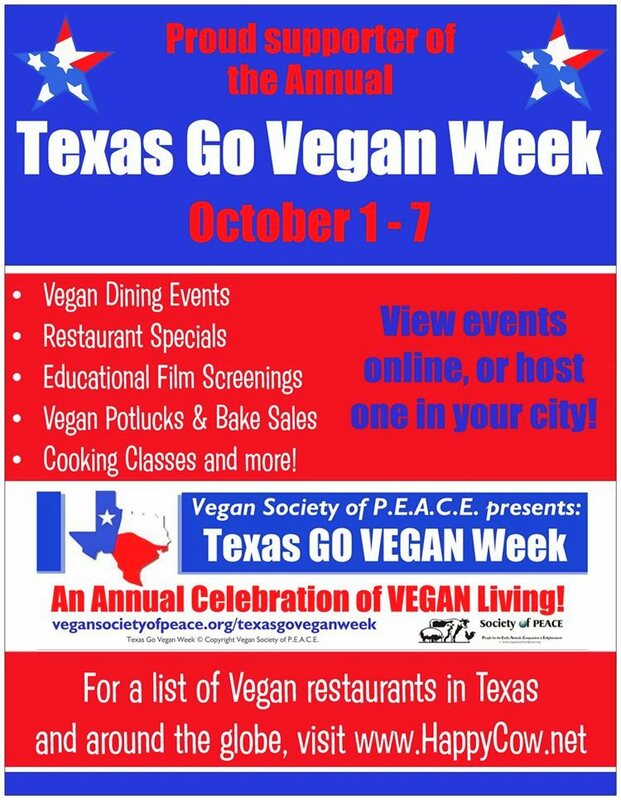 Please remember to submit your event to texasgoveganweek@vegansocietyofpeace.org! Please support all vegan restaurants in Texas and help this campaign continue to grow!